The session was dominated by citizen requests for protection of historic sites in the county and by concerns about the county’s Unified Development Code, which regulates development in the county. The largest number of the 50 citizens present were there to support changes in the Unified Development Code dealing with landscaping at development projects. Russ Page, long an advocate of preserving rural and historic sites in the county, took the opportunity at the front of the meeting to calls for preservation of a 1.5-mile-long site on the Oconee River at what is now known as Barnett Shoals. The site includes an early colonial fort, a thread mill with an active hydroelectric generator, a mill town with cemetery, church, store, and school that had been home to 43 families, and a gristmill, Page said. Page told the Commission that he and an informal group of people interested in preserving the area will be submitting a formal proposal to the Board showing how the site could be preserved and promoted. Included will be a plan for a museum, Page said. “Buy the land. Build a museum,” Page said. Jon Williams from Williams and Associates, a land planning and engineering firm at 2470 Daniells Bridge Road, took the microphone next to advocate for changes in the “Landscape and Buffers” section of the Unified Development Code. Williams said his company has been working with Oconee County landscape designer Jane Bath and others to amend the landscape ordinance. The goal is to create regulations that are “more user friendly and more design oriented,” Williams said. The new regulations should follow “good landscape architectural practices,” he said. According to Williams, the current code has sections that contradict each other. Spacing issues for trees are a problem. The county needs regulations creating larger islands in parking lots and better drainage in those islands, Williams said. Board of Commissioners Chair Daniell said the county would wait until work on the 2018 Comprehensive Plan is completed before turning to a review of the entire Unified Development Code. Andrew Malcom, 1020 Bowman Way in Northwest Woods subdivision, said he wants the county to rebuild an ornamental covered bridge that used to be part of the subdivision. Commission Chair Daniell said the costs for replacement of the bridge, which the county thinks was damaged by a contractor, was too high to justify. Daniell said the funding was to come from money set for historic sites from the Special Purpose Local Option Sales Tax, and the Board has decided this was not the proper use of funds designated for historic funds. Another citizen spoke up to support Malcom as the meeting progressed. The meeting was unusual in that most of those who spoke during the hour-long session asked the Commission to do something, rather than posed a question to the commissioners, as has been the norm at the Town Hall meetings. Other requests were for funding for preservation of Eagle Tavern in downtown Watkinsville, for support of a bypass of Bishop, and for a commitment to protect neighborhoods and creeks in the county as sewer lines are expanded. One speaker asked the county to clarify its section of the Unified Development Code on raised slabs that can be used in housing construction. Sarah Bell, president of the Historical Society, said the group supports preservation of sites in the county, though she said no formal vote had been taken on Page’s proposal for Barnett Shoals. Landscape designer Bath, who lives at 2430 Snows Mill Road in the west of the county, urged the Commission to act now, rather than later, on the revisions to the landscape provisions of the Unified Development Code. Bell asked for Watkinsville Garden Club members to stand in support of Bath, and about half the room stood. Jeanne Barsanti, 1170 Oliver Bridge Road in the south of the county, asked “what your feelings as commissioners are” about doing a local Transportation Special Purpose Local Option Sales Tax, now that Clarke County has passed its own TSPLOST. In the Nov. 7 election of last year, 73.9 percent of Clarke County voters approved an increase in the local sales tax by 1 percent, to a total of 8 percent, to support a mixture, roadways, trails and sidewalk projects. In 2012, as part of a 12-county regional vote, only 35.0 percent of Oconee County voters approved a similar regional transportation tax. At that time, 51.7 percent of Clarke County voters approved the tax, which failed because all of the other counties voted against the proposal. The overall vote was only 35.3 percent in favor. The sales tax in Oconee County now is 7 percent. 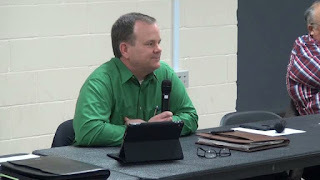 In response to a question by Mary Rabai, 1061 Pine Hill Road, off Mars Hill Road, Commission Chair Daniell restated a commitment to reach a decision on the future of the county’s Animal Shelter this spring. Page started his comments at 0:53 in the video. Williams started his comments at 9:35 in the video. Barsanti asked her question on TSPLOST at 22:48. Bath made her appeal for immediate action on the landscaping provisions of the UDC at 30:47. Rabai asked about the Animal Shelter at 56:58. OCO: BOC Town Hall Meeting 1 23 18 from Lee Becker on Vimeo. A billion dollars worth of new taxes a couple years back. TSPLOST referenda coming around like clockwork. Then come to find out unspent "Found Money" from SPLOST going back fifteen years. So much money they have a hard time spending it. A citizen also asked about the unspent SPLOST monies and John Daniell reviewed the remaining monies, indicating that they will be spent on what they had been designated for such as courthouse renovations. They will look at spending on historic preservation also as funds are unspent in that category. I thought he gave a reasonable answer to the question. I had similar concerns, Xardox, that they should not get more money when they don't spend what they have, but at least he did answer why the money is currently unspent. I think the TSPLOST may fail if it is only for roads. We have many new residents looking for sidewalks, bike paths, etc. The Athens-Clarke vote attracted both people interested in roads and those interested in alternative transportation and quality of life issues.